Windows 7 specifications may seem to be rather steep to someone used to running Windows XP on a PC with bare bone configuration, but it sure is justified. 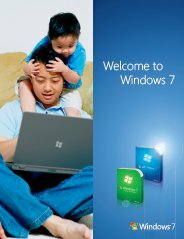 Windows 7 has plenty of nifty utilities and software tools embedded into it in order to make your PC usage as comfortable and enjoyable as possible. Running these many tools at a time does take a toll on the CPU and requires additional resources to keep all those running properly. Here are some of the Windows 7 specifications that your PC must meet, in order to run this wonderful operating system. Be prepared not to pinch on the pennies here or your fancy new operating system may never boot up at all. You will need at least a 1 GHz processor with a good mid-range motherboard. If you are planning to run Windows 7 64-bit then make sure that your processor is of 64-bit architecture as well. Otherwise, a 32-bit, single core processor will get things done. Be sure to purchase a good motherboard, since this is the base of your PC, and will help in running many of the system intensive processes of Windows 7. Try not to skimp on physical memory (or RAM). 1 GB of RAM will get you by, but 2 GB RAM is the sweet spot for Windows 7, especially if you wish to unlock the beauty of the fancy graphical effects in the operating system. Windows 7 installs a ton of files in your hard disk, and correspondingly requires high amount of storage space. Make sure you have at least 16 GB (32-bit) or 20 GB (64-bit) of hard disk space available for the operating system. You will also need additional hard disk space for the Windows Page File. So, all in all, you are looking at consumption of around 20-25 GB of hard disk space, depending on the size of the page file in your edition of Windows 7. You will also need a DVD-ROM drive in order to install Windows 7. The operating system is not available in CDs, so DVD-ROM drive is one of the indispensable Windows 7 specifications. These Windows 7 specifications apart, you will also need a DirectX 9 graphics processor with a WDDM 1.0 or higher driver. Otherwise, you will not see anything displayed on your monitor when you try to install Windows 7.